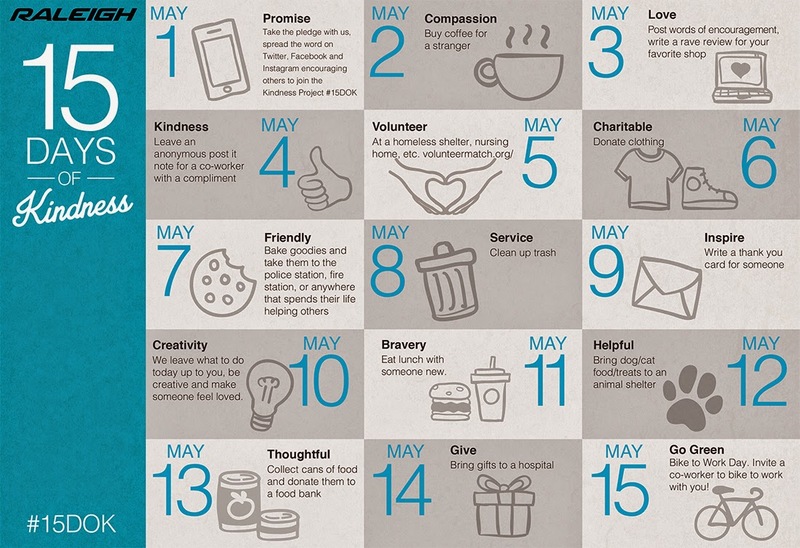 Take the Raleigh Bicycles 15 Days of Kindness Pledge! Century Cycles and Raleigh Bicycles are building a strong community, so we're encouraging everyone to participate in Raleigh's 15 Days of Kindness campaign. We want to be kinder, braver, more helpful, more giving, more green. 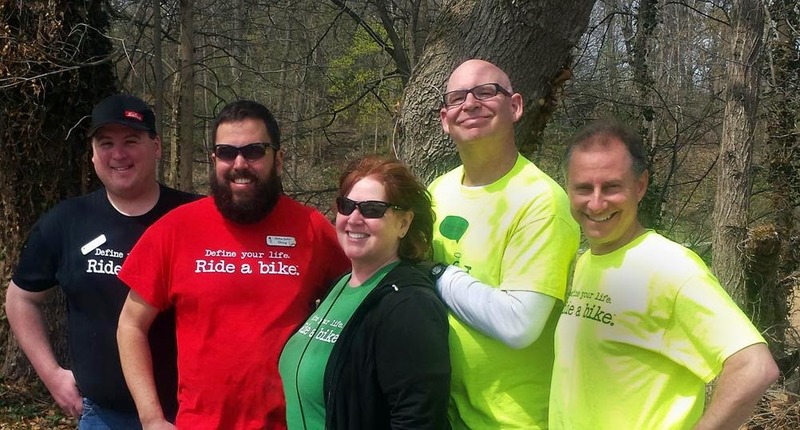 Beyond tying the 15 Days of Kindness into May being National Bike Month, we want to help enable cycling access and celebrate a great start for the first time rider. The journey starts simply, one day at a time, by committing simple acts that will help enrich and enhance the lives of people around you. Take the pledge to join us! When it comes to protecting your head from injury, any bike helmet is better than no helmet. All bike helmets sold at Century Cycles are certified to meet the standards of protection set by the Consumer Product Safety Commission. There's a new game in town that steps it up a notch. Traditional bicycle helmets are designed to protect you from forces directed in a straight line to the surface of the helmet. Recent studies have shown, however, that ROTATIONAL forces are a significant factor that contribute to brain injuries such as concussions. New bike helmet technology known as MIPS, or Multidirectional Impact Protection System, if available in select helmets from industry leaders Bell and Giro. MIPS can mitigate the effects of rotational forces by providing a movable plane between your head and the outer shell of the helmet. It's available in models for both road and mountain biking. The Bell Stoker MIPS is ready to step up your trail-riding game, and flaunts plenty of substance with style. 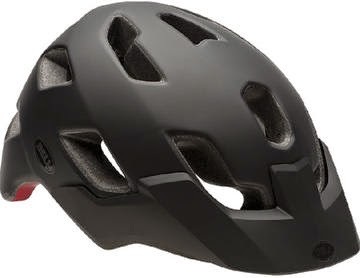 This wonder helmet sports Bell's Fusion In-Mold Microshell for excellent strength and low weight, plus their SpeedDial fit system and Cam-lock straps for an easy to adjust fit that won't shake loose no matter how rough the trail. Thirteen vents and four brow ports keep air flowing so you stay cool, and the adjustable visor is goggle compatible. 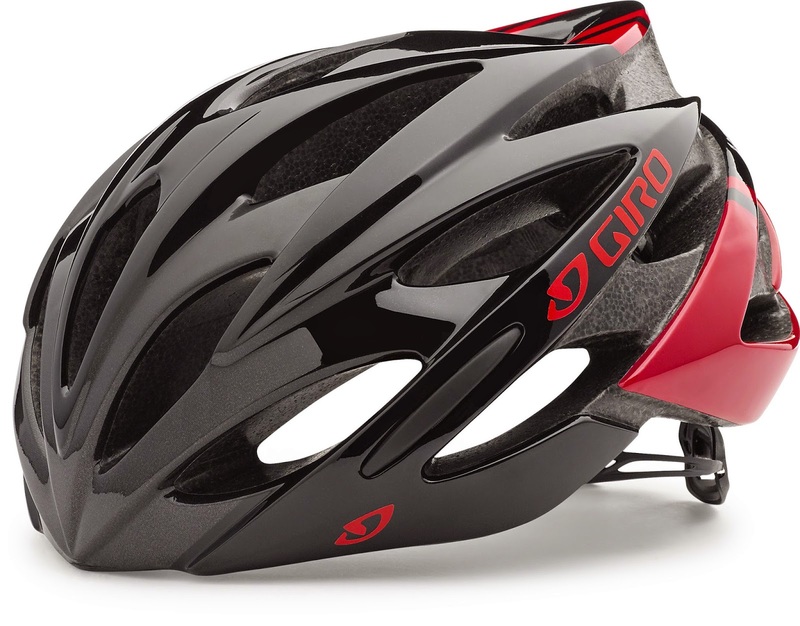 The Giro Savant MIPS is an amazing fit for riders who enjoy great routes as much as a swift pace. The Slim shape combines impressive ventilation thanks to 25 Wind Tunnel vents, plus the comfortable convenience of the adjustable Roc Loc 5 fit and stability system. Call us to verify size availability in the Century Cycles store nearest you! 5 Common Misperceptions About I.M.B.A. Have you encountered a mountain biker who refuses to support or join the International Mountain Bicycling Assocation, or their local IMBA chapter, because of mistaken assumptions about how we operate? Here are five common misunderstandings and some related information to help clear up the confusion. Let's tackle one of the most common misperceptions first—that IMBA promotes "trail standards" that don't allow for technically challenging riding. Nonsense! IMBA has never published or promoted any kind of "standard" for trail design, and we do not ask local groups to conform to a preordained style of trail building. IMBA does promote the idea that trails should be built to be durable and resistant to erosive forces, which generally means avoiding building on a fall line or otherwise excessively steep grades. But we are all for big drops, committing jumps and burly rock gardens, so long as that is the intended riding experience, and that construction is performed with the land manager's approval. It's not unusual to read comments like, "Why would I support a national organization when the trails I care about are at home?" First off, most riders like to visit new places from time to time, so we think they would want trail systems in other locations to be great, too. 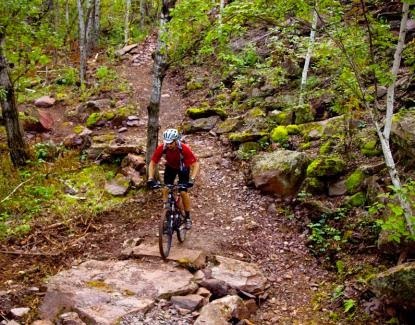 More importantly, even if the trails that matter most to you are the ones in your backyard, IMBA is putting a big effort into programs that support local-level trails. IMBA's nearly 200 U.S. chapters receive the highest level of support—including grants, advanced training sessions and professional assistance from region-based directors and pro trailbuilders—so they can be more effective than ever before. IMBA was born from the need for advocacy and that continues to be a primary focus of our work. IMBA's professional advocacy/policy team works every day at the local, state and national levels to protect and expand access to trails. So, why doesn't IMBA file heaps of lawsuits to open trails? We rarely go that route because it's often the least effective way to create more opportunities for mountain biking—court rulings can get overturned, are expensive to file and it's ultimately hard to predict the outcome. Our focus is on forging effective, long-term partnerships and influencing agencies, lawmakers and other decision makers. Some critics say IMBA is too closely aligned with "wreck-reation" groups and should promote conservation values more frequently. Others are just as loud in taking the opposite view and arguing that we are too sympathetic to conservationists. The balance we actually strive to achieve is to encourage responsible outdoor recreation that respects the natural world and protects its integrity while encouraging people to experience it on bicycles. To that end, we partner with dozens of pro-recreation and pro-conservation groups—the ones that agree that these values are thoroughly compatible. Supporting IMBA is easy—sign up to receive monthly, regional email newsletters to stay up to date on new trails, access threats, volunteer opportunities and bike events near you. Or, become a member! A basic membership is merely $30 and, with that, you can support both your local IMBA chapter and IMBA's nationwide advocacy work. Sign up by the end of May and you'll be entered to win a mountain bike trip for two with Western Spirit, or a Specialized Enduro bike. And we (Century Cycles), might add that when you join IMBA, you automatically become a member of the Cleveland Area Mountain Bike Association (CAMBA), which is an IMBA-affiliated local chapter, so 40% of your dues are returned to the local area. Moreover, Charity Navigator, which is the internationally-recognized authority on rating charity/non-profit organizations, gives IMBA a 4-STAR rating (the highest possible) overall. One positive factor that goes into this rating is that 88.4% of IMBA's expenses are spent on the programs and services that it delivers. Electric bicycles? Yeah, we've got that. Electric bicycle sales have been breaking records among bike commuters in Europe and Asia, and are just starting to take off here in the USA. 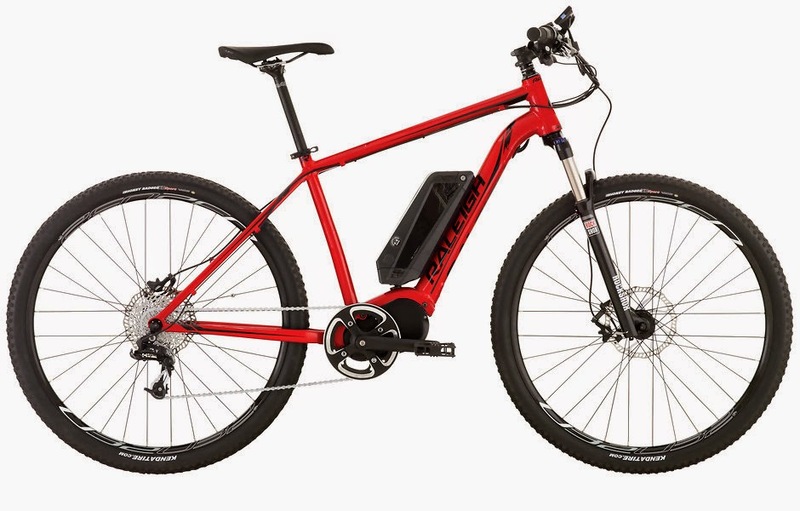 Raleigh Bicycles is now offering a full line of electric bikes. With industry-leading specs borrowed from their sister brand Currie Technologies, backed up with the award-winning service of Century Cycles, if you've been thinking about an electric bike, now is the time to try one! The Raleigh Detour iE features a 500-watt rear hub drive motor to make the going easy, and Tektro mechanical disc brakes to make stopping even easier. 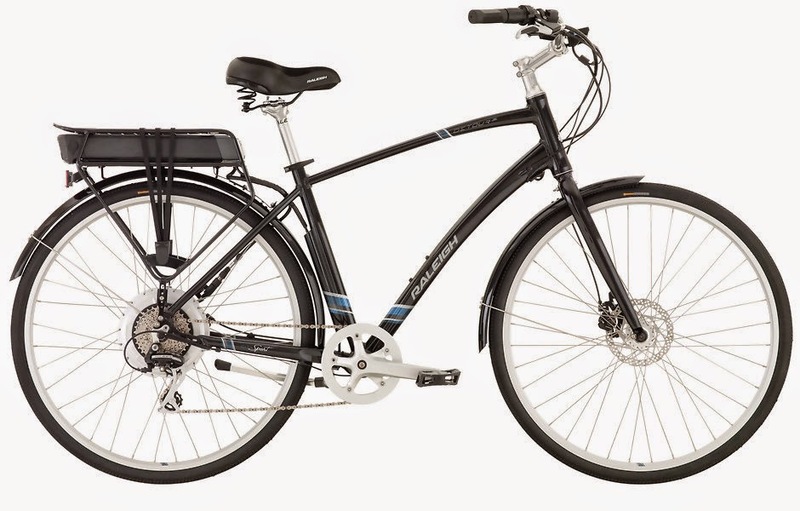 Also available in a step-through/women-specific model, the bike includes a kickstand, fenders, and rear cargo rack for convenience on your around-town errands. The Raleigh Tekoa iE opens up a whole new world of riding with its 350-watt center-drive motor and Tektro hydraulic disc brakes. The 29-inch wheels and RockShox suspension fork scrub out the bumps. The Raleigh Misceo iE is the sportiest way to get around town! Featuring the new Shimano STePs center-mount drive train, Shimano Alfine Di2 8-speed internal gear shifting, and Shimano hydraulic brakes, anybody can feel fast and confident! We have these bikes in stock at Century Cycles, so stop in for a test-ride! Please call the store nearest you to verify model and size availability. Press Release: Bike To School Challenge begins in May; over 5,000 students in NE Ohio schools take part in largest youth cycling event in the U.S.
ROCKY RIVER, Ohio – Over 5,000 middle school, high school and elementary school students in the Cleveland, Ohio suburbs of Bay Village, Rocky River, and Medina begin the 2015 Bike to School Challenge in the coming weeks, committing to ride their bikes to school to help the environment, get more physical activity to improve their health, have fun and win prizes. The award-winning program is May 4-22, 2015, and is the biggest bike-to-school program in the United States. It returns for its eighth year at Bay Village schools, its fifth year at Rocky River schools, and its fourth year at Medina schools. Another significant ride day for the challenge will be Wednesday, May 6, which is National Bike To School Day. In 2013, 634 Bay Middle School students biked on that day, exceeding their goal of 600, and making it the most-biked school day in the country for the nationwide event. The Bike To School Challenge concludes on Friday, May 15 at A.I. Root Middle School, Claggett Middle School, and H.G. Blake Elementary School. Thursday, May 21 is the final day of the challenge at Kensington Elementary School. The Bike To School Challenge concludes on Friday, May 22 at Bay High School, Bay Middle School, Westerly Elementary School, and Rocky River Middle School. Westerly Elementary School was the first elementary school to participate in the Bike To School Challenge in 2014. This year sees the addition of two more elementary schools with H.G. Blake Elementary School and Kensington Elementary School. In just three weeks last May, students taking the Bike To School Challenge logged 41,179 miles, burned 1,647,160 calories, prevented 33,827 pounds of carbon dioxide emissions, and saved their parents $6,326 in gasoline. Century Cycles bicycle store is the main corporate sponsor of Bike To School Challenge and organizes the program for the schools. The other main corporate sponsor is national bicycle manufacturer Raleigh Bicycles. Bike Cleveland is a program-wide sponsor. At Bay schools, the program is also sponsored by Subway of Bay Village, Honey Hut Ice Cream Shoppe, and Project Earth Environmental Club. In Rocky River schools, Subway of Rocky River (Detroit Road), Honey Hut Ice Cream Shoppe, Starbucks, and Rocky River PTA are also sponsors. In Medina, Dairy Queen, Subway, Domino’s Pizza, Rinky Dink Family Fun Center, Medina Veloists, and Arby's are also sponsors. Inspired by a student car boycott to protest high gas prices in 2007, Century Cycles owner Scott Cowan approached his alma mater Bay High School about what he could to encourage more bicycling to school. Bike To School Challenge was born and was enthusiastically embraced by the students and faculty. Participation in 2008 exceeded organizers’ expectations. In 2009, the program was expanded to include Bay Middle School. It expanded to Rocky River Middle School in 2011 and to the Medina middle schools the following year. In 2010, Bike To School Challenge won the city’s Project of the Year Award from the Bay Village Community Council. Everett Finn stopped by the Century Cycles store in Peninusla on Thurday, April 23, 2015. He left from Omaha, Nebraska three weeks earlier. He braved the cold temperatures of the day, not to mention the narrow winding road of State Route 303 from Brunswick. He's headed to New York state to meet his nephew, where they'll ride together on the Erie Canalway Trail. 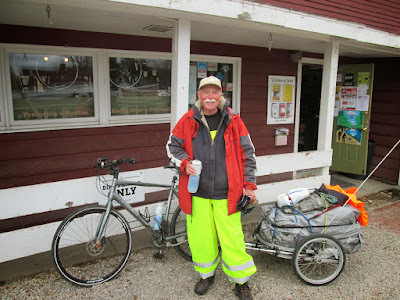 You can view more pictures of long-distance touring cyclists who have visited all three of our stores in our Bicycle Touring Photo Gallery. We have always done our best to accommodate the needs of bicycle touring riders who stop in our stores. All three of our stores are located on bike touring route established by the Adventure Cycling Association. Our Medina and Peninsula stores are located on the Underground Railroad Bicycle Route, and our Rocky River store is located on the Northern Tier Route. What is Ohio's top tourist attraction? Vote today! Cleveland.com is conducting an online poll to rate Ohio's top tourist attractions. Of course, we are partial to the Cuyahoga Valley National Park, home of the Towpath Trail, Ohioans' favorite destination for biking and hiking! You can cast your votes, with attractions broken down by region (Northeast, Southeast, Central, Northwest, and Southwest). To vote, click here. 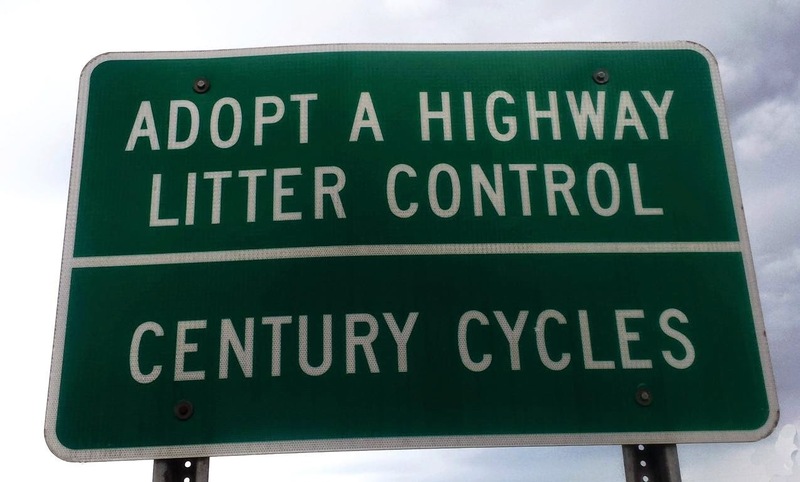 Century Cycles is proud to be the Adopt-A-Highway sponsor for the stretch of State Route 303 just east of downtown Peninsula. 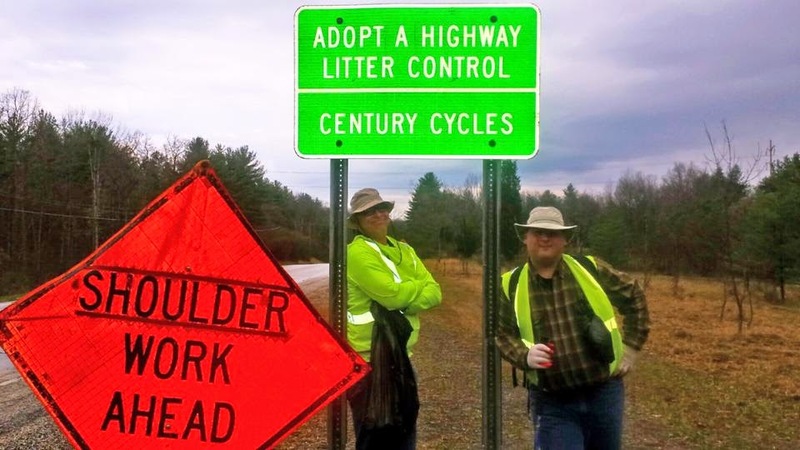 Yesterday we held our clean-up day to do our part to take care of the road! 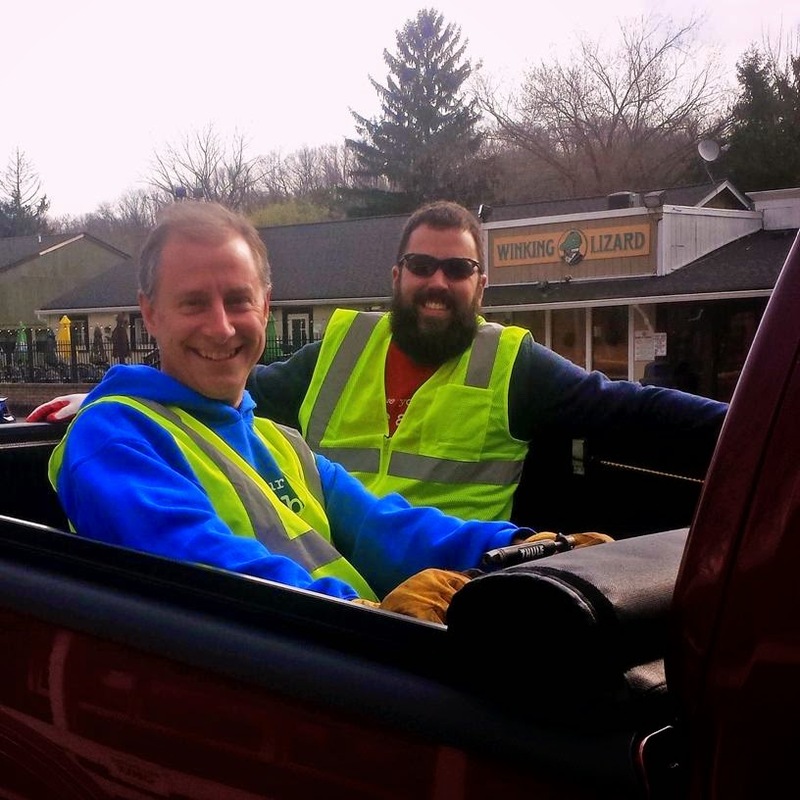 Thanks to Doug and Chris from the Peninsula store, Petch (and Lady Petch) from the Medina store, and CC owner Scott from the Rocky River store for lending a hand, and thanks to Lady Petch for the photos! 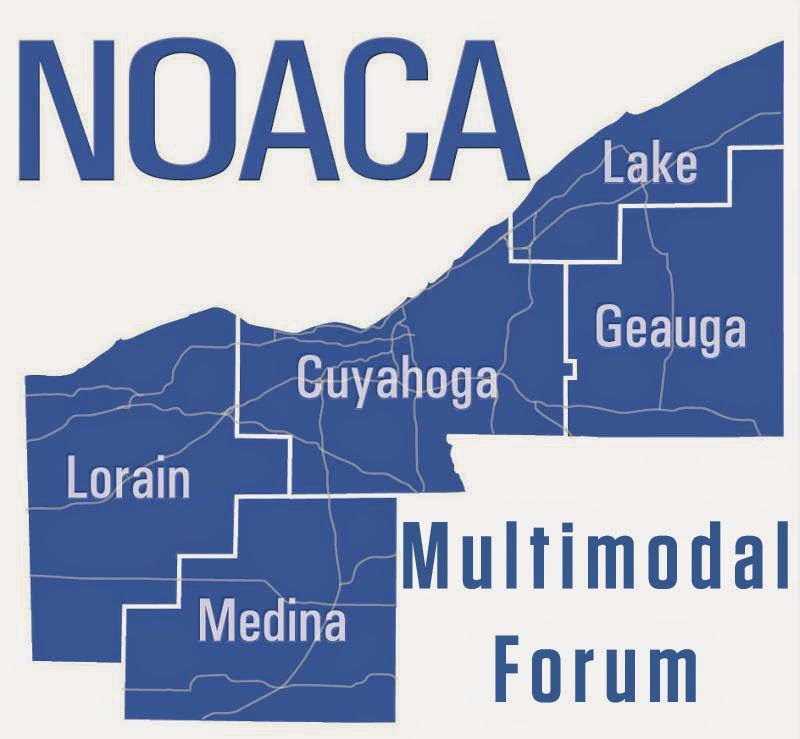 The Northeast Ohio Area Coordinating Agency (NOACA) have drawn up plans for the redevelopment of Rocky River Drive between Lorain Avenue and Brookpark Road. A third public meeting will take place on May 13th to discuss the proposal. Learn more about the plans and why you need to go HERE. While you're there sign Bike Cleveland's petition and make your voice heard! 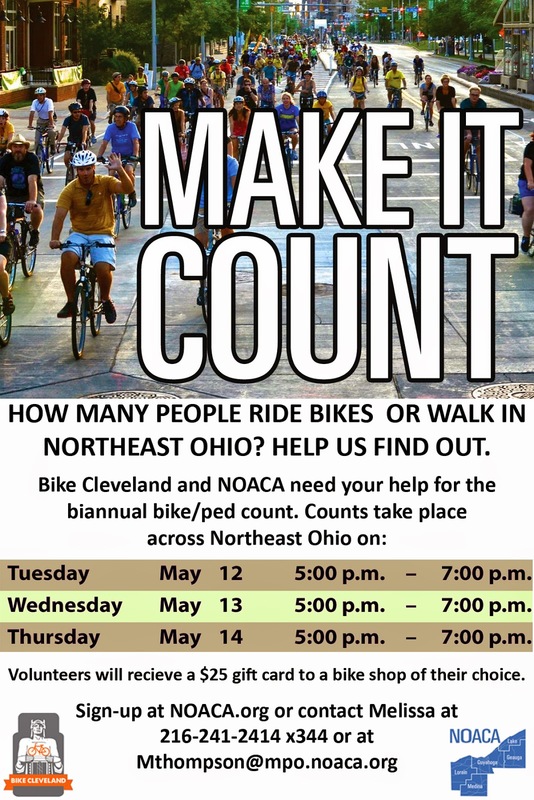 How many people ride bikes or walk in NE Ohio? Help us find out! Gauge regional and local levels of bicycling and walking beyond what is already available from Census data. Identify trends based on count data to aid the planning and design of multimodal transportation infrastructure, as well as the implementation and execution of encouragement, educational, and enforcement programs. Aid in the prioritization of bicycle and pedestrian infrastructure and planning projects. To volunteer, take the survey or learn more here. Team Left Hand / Century Cycles announces our schedule of training rides for the Bike MS Buckeye Breakaway! We've scheduled rides from all three Century Cycles stores; all of the rides are on Tuesdays and begin at 6:30pm. You can also download the schedule as a printable flyer. The rides will be about 20 miles long. Stick around afterwards, and you may be treated to special refreshments (hint: from Left Hand Brewing Company). We had 21 riders show up in Peninsula for our first Sunday Service Group Road Bike Ride of the season. Thanks to everyone for coming! It was warm and sunny with blue skies, a perfect day for a bike ride, other than the seemingly constant headwind (in both directions) in the Cuyahoga Valley! For people who carry their smartphones with them while riding their bicycles, the Topeak DryBag for the iPhone 5 has been a popular seller for us. Finally arriving in our stores today is the new model, the Topeak DryBag for iPhone 6 and the Topeak DryBag for iPhone 6 Plus! 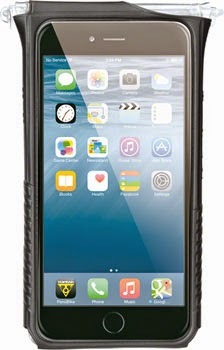 Like the original models, the new DryBag for iPhone 6/6Plus is made of a waterproof material that's sonically welded and seam sealed to repel weather, mud, and water for ultimate phone protection. It features a foam body for protection and a clear touch-screen-compatible window for viewing and operating the phone's display. The integrated QuickClick mounting system lets you mount or remove the DryBag in seconds. 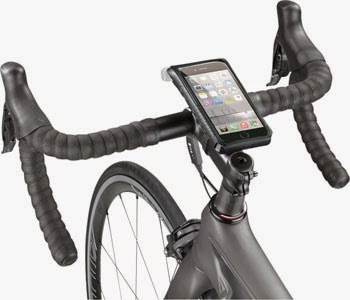 It keeps your iPhone 6 or 6 Plus handy for communication or to use as a GPS during longer rides. The Topeak DryBag for iPhone 6 ($34.99) and Topeak DryBag for iPhone 6 Plus ($39.99) will be arriving in stock in all three Century Cycles stores today! 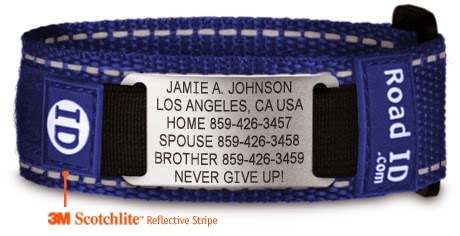 Road ID is available in several different styles, most in several colors. The information that appears on your Road ID is completely customizable. Take a Road ID pamphlet from our store, which has a coupon good for FREE SHIPPING when you order your Road ID. Orders are shipped within a few days from Road ID's headquarters in Kentucky, USA. 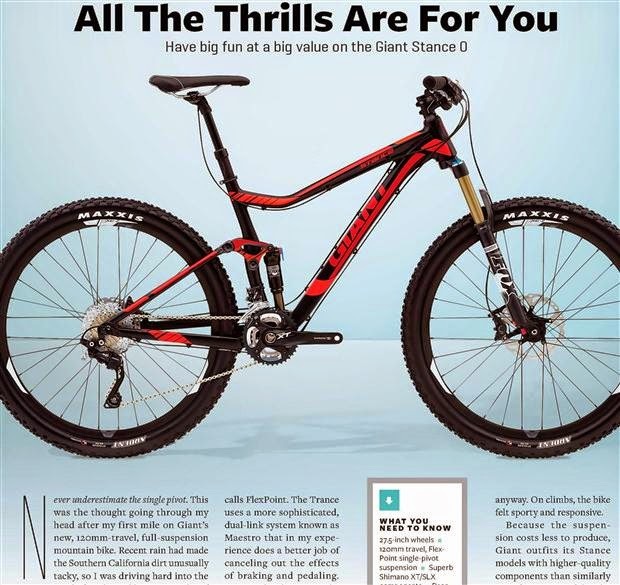 Bicycling Magazine says the Giant Stance 27.5 delivers "Big Fun, Big Value"
Bicycling Magazine reviewed the 2015 Giant Stance 27.5 0 mountain bike in its May issue, praising its FlexPoint suspension system and mix of high-quality components including a Giant dropper seatpost. The dropper seatpost is an innovation on mountain bikes, allowing you to change the seat height on-the-fly using a handlebar-mounted remote control lever. Keep it at you maximum height for efficiency while climbing, then drop it out of the way for aggressive descents! The FlexPoint suspension system is not as advanced as Giant's Maestro suspension system, but that allowed Giant to spec higher-quality parts that you normally wouldn't find on a bike at this price point, including a Fox fork and rear shock, Shimano SLX shifters, front derailer, and hydraulic disc brakes, and Shimano XT rear derailer and crankset. To read the full review of the new Giant Stance 27.5 0, pick up the May issue of Bicycling Magazine, out on newsstands now. Stop into the Century Cycles store in Medina for a test ride, because we've got this bike in stock! Sunday Service Group Road Bike Rides - back for our 3rd year! Are you new to cycling, and want to try your skills at riding out on the open road? Experienced rider just looking for a casual morning ride? 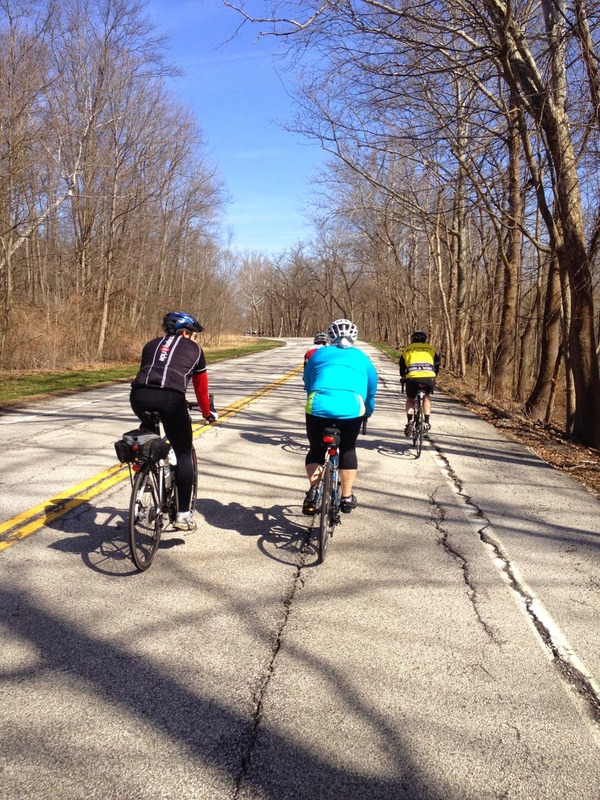 Join us for our Sunday Service Group Road Bike Rides! The rides are scheduled at all three of our stores on selected Sunday mornings April through October. The rides are a moderate pace, and we won't leave anyone behind. In Medina, we ride on the third Sunday of each month. Start at 8:00am in front of the store. The route is about 20 miles long. At the Peninsula store, we ride on the first Sunday of each month. Start in the store parking lot at 10:00am, or 8:00am between Memorial Day and Labor Day weekends. The route is about 18 miles. 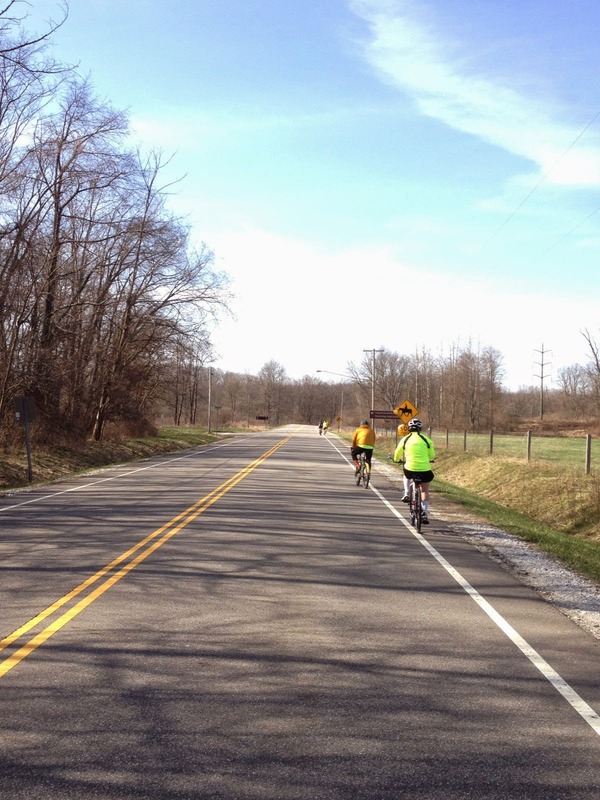 In Rocky River, we ride on the second Sunday of each month. Meet at 8:00am at the back door of the store. The route varies depending on who shows up and what they decide! Note that the weekly schedule is pushed back one week in April due to the Easter Sunday holiday. 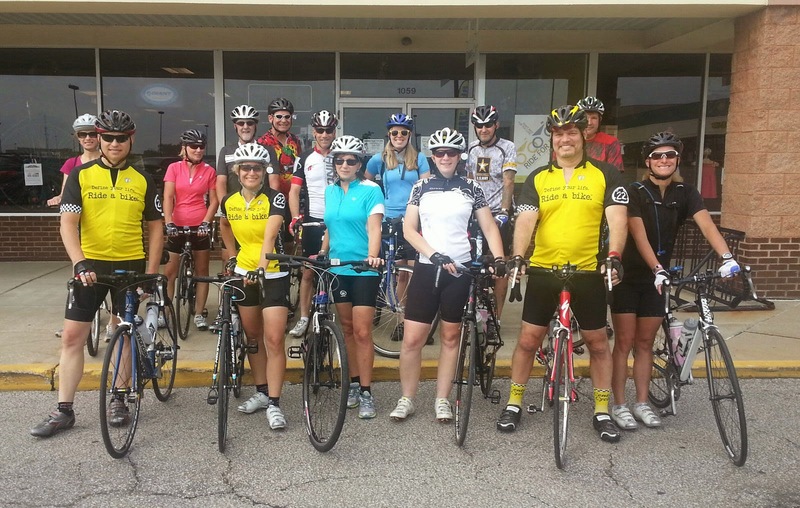 Our Sunday Service rides made excellent training rides for the Bike MS Buckeye Breakaway and other events! So, whether or not you're part of Team Left Hand/Century Cycles, all are welcome! Back in November, we told you about some new ways to carry gear on your bike, including the Blackburn Outpost Cargo Cage. Blackburn Design further expands its gear-hauling options, with cool new products great for whether you're bikepacking, bike commuting, or just need some extra hauling room on any bike ride. The Blackburn Outpost Handlebar Roll is perfect for carrying a sleeping bag, small tent, clothing, or just about anything that can fit into the include waterproof stuff sack with convenient double openings. You can also use your own stuff sack if a different size bag suits your needs. The quick-release handlebar clamp works on any size bar, from the 25.4mm traditional mountain handlebars to oversize 31.8mm handlebars. 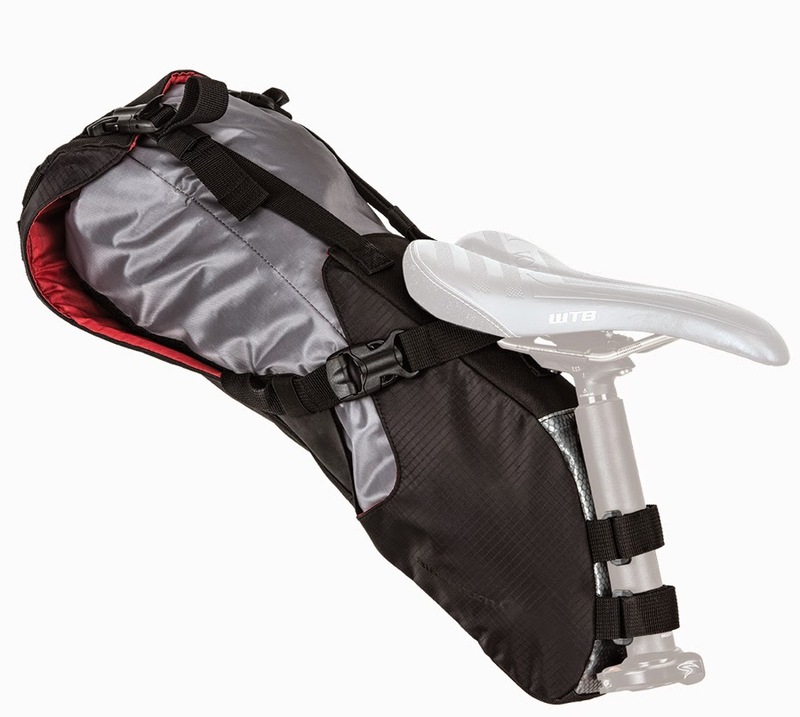 The red webbing stabilizer straps also doubles as a shoulder strap for off-the-bike use. The whole setup can handle up to 8 pounds of gear. The Blackburn Outpost Seat Pack has adjustable stabilizer straps to tightly hold any size load that you can fit in the included weather-resistant stuff sack, or your own stuff sack! Double seat rail and seat post straps tighten to keep the load secure. 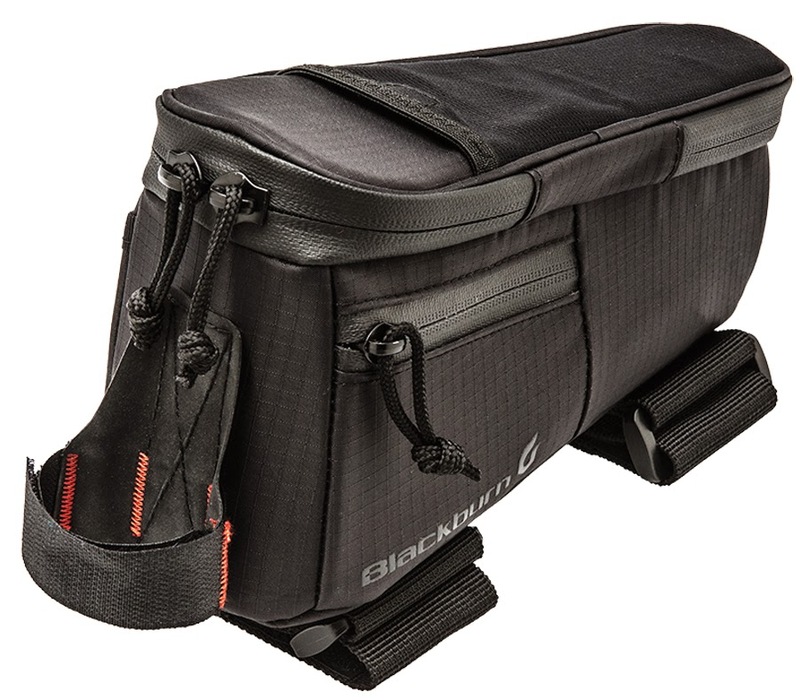 The Blackburn Outpost Top Tube Bag has a spacious interior with an adjustable organizer, and exterior mesh pocket for a phone or camera, and a zippered pocket for an ID, cash, or credit card. The top tube straps and steerer tube strap mount quickly on almost any bicycle. The ripstop water resistant nylon construction keeps your essentials handy within reach! The bikepacking items from Blackburn Design are currently in stock in our Peninsula store. As always, if you'd like to check them out in either Medina or Rocky River, give us a call, and we can send them to another store; no extra cost or obligation on your part! 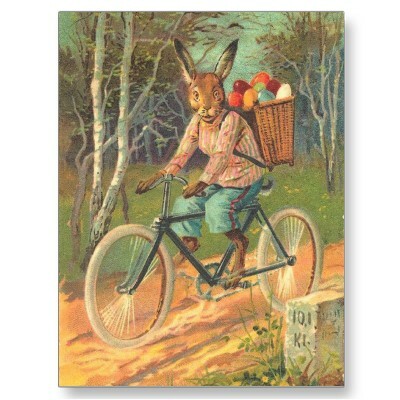 PLEASE NOTE: All three Century Cycles stores will be CLOSED on Sunday, April 5, 2015 for our staff to enjoy the Easter holiday (and maybe even a bike ride!) with their loved ones. We hope you have a wonderful Sunday and apologize for any inconvenience. For complete store hours, please visit www.centurycycles.com/for/hours. 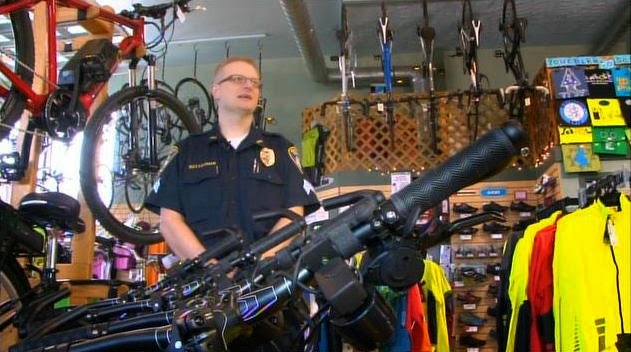 The Century Cycles store in Rocky River is honored to be helping the Rocky River Police Department equip its first-ever bike patrol unit! Inspired to Ride Teaser Trailer from Mike Dion on Vimeo. Inspired to Ride is the latest feature from the makers of Ride the Divide and Reveal the Path, and is sponsored by Salsa Cycles. It follows a handful of cyclists from around the world as they race unsupported in the inaugural year of a 4,233-mile transcontinental race across the USA. This race is the antithesis to events like Tour de France and Race Across America. There will be no teams, no support vehicles, no special jerseys, and not a dime in prize money. On June 7, 2014, forty-five cyclists from around the world set out on the inaugural Trans Am Bike Race, following the famed TransAmerica Trail. Their mission is to cover 4,233 miles in one enormous stage race, traversing through ten states in a transcontinental adventure of epic proportions. Inspired To Ride follows closely the journey of a handful of these cyclists as they prepare, compete and experience what riding 300 miles a day feels like with only a few hours of sleep. They will rely solely on their fitness, meticulously chosen gear, and mental fortitude to get them to the finish. And to make it even more interesting, they’ll be self-supported – no crew, no follow vehicles, and no prize money waiting at the end. These athletes will endure agonizing climbs in the Rockies, driving winds in the Great Plains, and sawtooth switchbacks in the Appalachians all for a pat on the back, potential bragging rights, and a cold beer when it's all over. Some are out to make history and set records, while others are simply trying to finish. Four cinematographers, cameras flying in the sky, and rider-mounted action cams galore will give the audience an incredibly immersive experience while these cyclists speed along the TransAmerica Trail revealing its varied landscapes, intriguing locals, and captivating stories which dot this path of discovery. Fattyshack returns to the Cuyahoga Valley this Memorial Day! Following on the heels of our wildly successful Fattyshack snow bike demo day at Brandywine Country Club this past January, Century Cycles has partnered with the Cuyahoga Valley National Park to bring you Fattyshack 2! This time around, we'll have the full demo fleets from Salsa Cycles and Surly Bikes, so with 50 fat bikes to choose from, there will be no lines and no waiting! 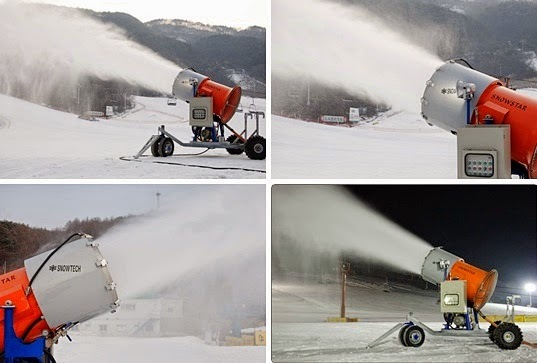 To bring the Winter Cycling Wonderland spirit to the Memorial Day holiday, the Cuyahoga Valley National Park, using a $439,516 grant from the John S. & James L. Knight Foundation, has purchased 12 SnowStar SnowTech 300 snow-making machines. Please note that the section of the Towpath Trail between Lock 29 and Boston Store will be CLOSED beginning at 7:00am on Sunday, May 29, as snow-making operations begin to prepare for the event. 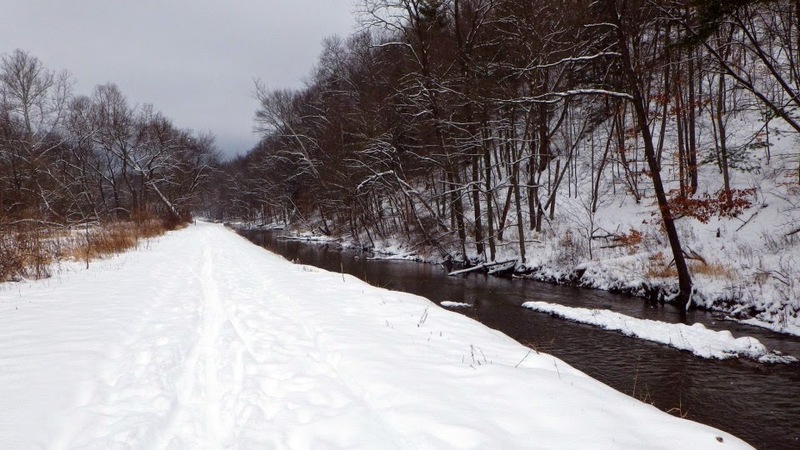 "We know that people all over Northeast Ohio can't wait for summer to be over with and the snow to fall so that they can enjoy winter sports in our National Park," said Craig Kenkel, Superintendent of Cuyahoga Valley National Park. "This new equipment will help us satisfy year-round snow lovers, and Century Cycles will help us kick off what we hope will be a continuing series of cold-weather events!" 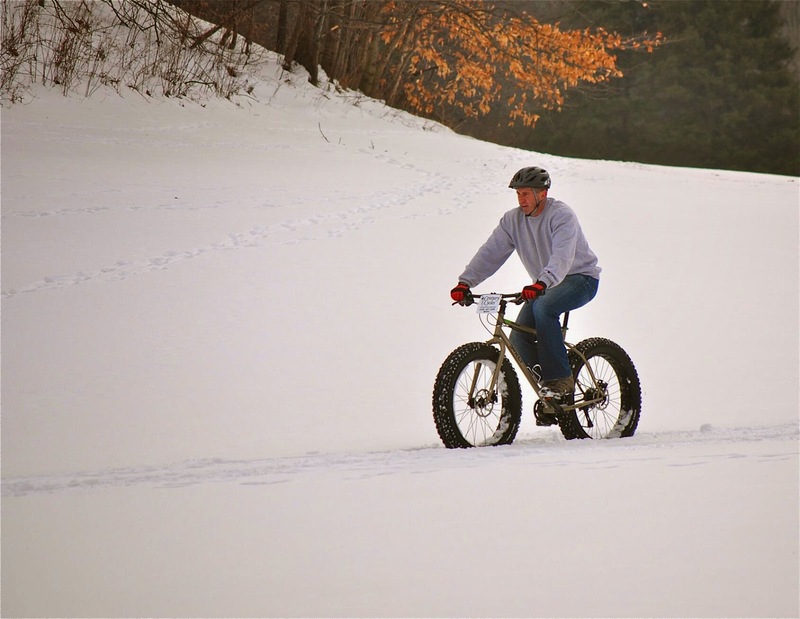 As with the original Fattyshack event, cyclists who have their own snow bikes are welcome to bring them to ride on the snowy Towpath Trail. Traditional Memorial Day festivities won't be forgotten, as a barbeque pit will be fired up, along with fireworks to close the festivities later in the evening. Stay tuned for more details regarding registration for Fattyshack 2!